The Muskie Library will have extended hours for finals week! During finals week (Monday, December 18 and Tuesday, December 19) the library will be open from 7:30 am – 7:00 pm. Students are encouraged to come use the extra study time to prepare for semester tests or final projects – FREE snacks (brain food) will be served from 5:00-7:00 pm every night. Good Luck, Muskie Nation! ASL Club is CANCELLED today. REMINDER: Any Junior student that received an invitation to the MCC Welding Career Academy will need to report to the Auditorium after 3rd period. An intercom message will be made. Please Help Support Muscatine High School Bands! For every purchase, you make at the Muscatine Hy-Vee Food (2400 Second Avenue) Store Monday, Dec 11 through Wednesday, Dec 13 that is accompanied by the attached slip, Hy-Vee will donate 7% of your total sale to the Muscatine High School Bands! Please support Muscatine High School Bands by shopping at the Muscatine Hy-Vee these three days! Boys’ Soccer Sign-up: Any boy interested in playing high school soccer, please sign up in the Athletic Office (rm 11-005). SOAP will meet from 7:30-9:00 this Thursday @ 2726 Brookview Rd. Hope to see you there! MHS Winter Glow Concert is a joint and collaborative concert with the MHS Chamber Orchestra, conducted by Mr. Jonathan Thoma, has been changed from December 8th to December 15th. Please mark your calendars! The concert will take place on Friday, December 15th at Ss. Mary & Mathias at 7:30 pm. Boys’ High School Soccer Open Gyms are on Sundays from 2-4 pm in the main gym. There will be NO open gyms on December 10 & 24, possibly the 31st. Open gms will start again January 7th and every Sunday after until soccer practice begins in March. Outstanding Fees: Letters for outstanding fees have been sent out to parents. Partial or full payments can be made. If you have questions, please contact the MCSD Finance Dept. at 263-7723. Key Club will be hosting a coat drive Monday, December 4th – Thursday, December 14th. Coats will be collected in the MHS library from 7:45-8:15 am and during lunch. All coats will be donated to local charities: the Muskie Locker and MCSA. Students who donate a coat will earn open-campus lunch on Friday, December 15th. Contact Mrs. Keltner or Key Club members with questions. Parking for Winter athletics at Pleasant Valley High School: Athletic spectators can park in the west lot or the new PVHS east parking lot off Scott Drive and enter PVHS from Spartan Stadium. Doors W1 and S7 will be open for all athletic spectators. OPERATION WALLACEA: Interested in an exciting opportunity that combines conservation ecology, marine biology, and traveling the world? Consider joining the expedition to South Africa, Summer 2019. The two-week trip includes African safaris, large mammal research, elephant conservation, and dive training. If you were unable to make the meeting, stop by another time to discuss more information with Mrs. Coffman in rm 11-017! Girls’ High School Soccer Open Gym will start December 3 from 4-6 pm in the main gym. Open gyms will be December 3, 10, 17. Open gms will start again January 7th and every Sunday after until March 4th which will be the last open gym. Muskies School Store: Would you like to purchase Muskie Spirit Wear/Accessories or to give as a gift? MHS Band Fundraiser: The Muscatine High School Band’s annual nut fundraiser is underway! 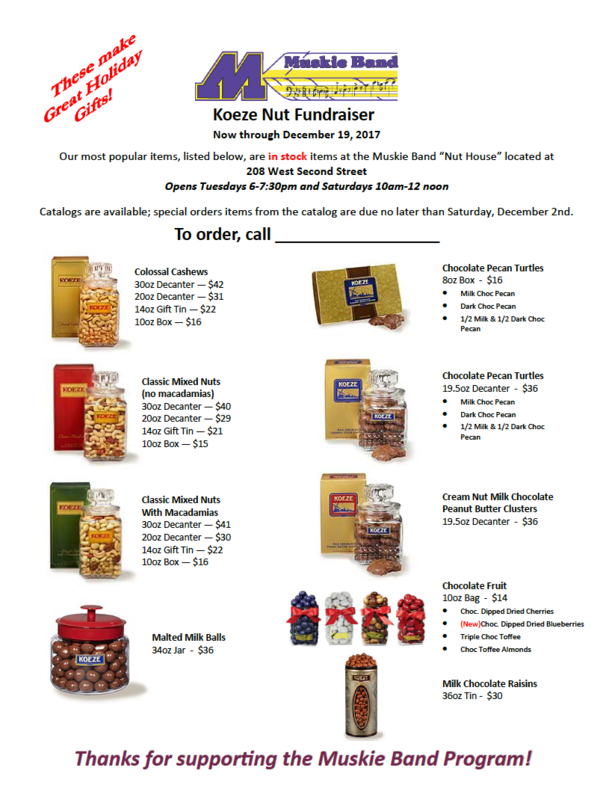 The Koeze products – cashews, mixed nuts, puddles (turtles), chocolate dipped cherries and blueberries, malted milk balls, and milk chocolate raisins – make great holiday gifts for family and friends, grab bags, and wonderful treats for yourself! be a very limited selection the last two weeks. If you need a gift for a co-worker, boss, pastor, friend, client, or Aunt Matilda, Koeze products make great presents! They’re also a nice gift for yourself! Funds raised go toward music, instrument purchases and repairs, uniforms, band camp section instructors, marching show-related expenses (props, transportation), honor band registrations, summer music camps, etc. Thank you for considering purchasing Koeze nuts and supporting the Muscatine High School band. Madison Elementary is looking for MHS students to help with our annual “Holidays Around the World” event on Wednesday, December 20th. If you are available afternoon only, that’s okay too! Please email stephanie.zillig@mcsdonline.org if you can help us out.